And Apple goes down again? 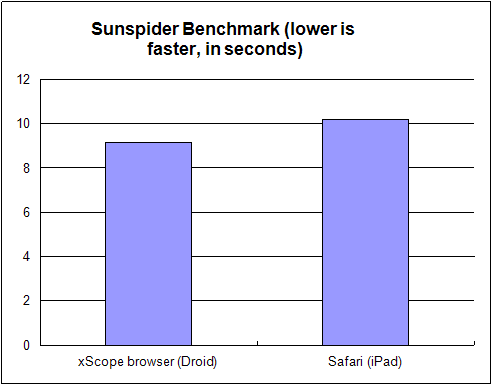 The work-a-holic developer behind xScope, one of the top Android browsers, just sent me test results showing the iPad’s Safari getting crushed by a Motorola Droid during a recent SunSpider benchmark test. Yes you read that correctly. 1. Fresh start of both iPad and Droid (To be fair to the iPad whose score went up to 15S without one.). 2. Droid: Running CyanogenMod, CPU = 1.1Ghz, xScope browser. Chalk up another win for Android and our baby, the Motorola Droid. I didn’t think it was possible to continue to be amazed by a device after almost 5 months, but it keeps happening. And we actually did a quick review of xScope a while back which you should check out. The one-fingered multi-touch is quite snazzy. Oh, our thoughts on iPhone OS 4.0 shouldn’t be missed either. For more information on SunSpider check out this link. Friday Poll: Revisiting the Forum Idea?